The first year I made candy and shared some at a party in 1995, I had no idea the impact they would have on both myself and the partygoers. People were amazed that mere mortals could make dark chocolate dipped truffles. 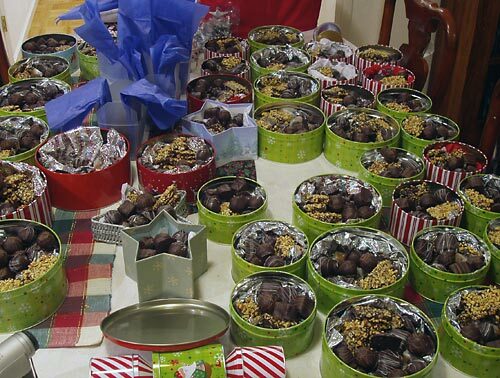 As the following year quickly passed and the holidays approached, I decided I would harness the power of candymaking in small gift packages for a dozen friends and family members. Behold the creation of “The List” where there was none before. And the list was good. Candy is a lot like love; the more candy you give, the more love you get in return. Naturally, within a few years I quickly ramped up from the initial list of one dozen recipients to more than thirty. Every year the volume of candy in each package has continued to grow, but it has recently reached an amount I think would make just about anyone happy. For every action there is supposed to be an equal an opposite reaction; with so much more candy, the size of the list crept upwards. Finally, several years ago, to protect my own sanity, I swore the list would not exceed forty recipients. As new people come and go from our lives—usually not at equal rates—we typically have to make some very difficult decisions each year. It is never fun to go to a party months after the holiday season and have one recipient loudly applaud the last batch of candies in front of a former recipient—awkward! I do tell people that if they return the gift basket or tin , their spot on the list is guaranteed for another year*. I’ve even had one regular recipient unload more than a dozen random metal tins they had collected over the year. *Offer excludes paper/disposable packaging. Not eligible in some states. Void where prohibited. Several years ago one recipient moved and failed to notify us of both the change in his living situation and his new address. That February we received a very distressed looking package with “return to sender, no forwarding address” stamped on it. That’s it! He was banished from the list, making room for another. This year, the list reached forty five recipients, four of which were sold to three lucky coworkers who heard about the option to purchase well in advance. “Oh, you can buy them?” other coworkers asked, clearly surprised. It’s evident I could sell more than twenty next year without even trying. With the addition of a slight, well deserved price increase I might even be able to offset some of the costs beyond the candies that are sold. Nevertheless, increasing the volume of candies is not without an added investment of my time, a cost I currently omit from pricing of packages. I may just need a second list to manage the individuals that are eligible to purchase. This entry was posted on Saturday, December 23rd, 2006 at 12:25 pm	and is filed under Candymaking, Essays. You can follow any responses to this entry through the RSS 2.0 feed. You can leave a response, or trackback from your own site. After reading about “The List”, I feel honoured to be included on it! If you have ever had the opportunity to sample some of Brian’s delights, you’ll understand why. The amount of effort that went into the packaging and the product was astonishing. His chocolates are amazing. I just hope I can maintain my listing for next year! Any updates on how to get on The List (or the second list)? Hi Rebecca, I’ve had so many folks return their tins this year that it is going to be tough to find any vacancies!